Mixed media, 52 1/2 x 74 3/4 in. James Cohan presents Passing through the gates of irresponsibility, an exhibition of new work by Simon Evans™ at the gallery’s Lower East Side location. This is the artist’s fifth solo exhibition at James Cohan. Simon Evans™ is the artistic collaboration between Simon Evans and Sarah Lannan. Together the New York-based artists create dense text-based collages brimming with poetic handwritten phrases, drawings, and images often scavenged from the detritus of everyday life both inside and outside the studio. The works depict and describe a universe suspended between the poles of earnestness and irony. With deft wit and a wry brand of melancholy, ambiguously personal and fictional narratives are woven into diagrams, charts, maps, taxonomies, advertisements, diary entries, inventories, and cosmologies that plunge the viewer into alternate states of pathos and hope. 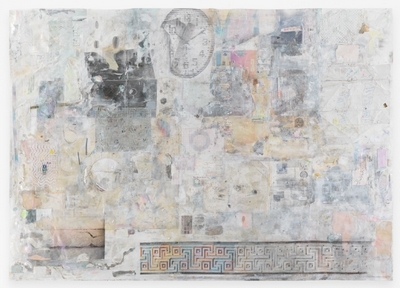 The works in Passing through the gates of irresponsibility demonstrate the continuous evolution and versatility of the artists’ distinctive visual language, reflecting their long-standing interests in concrete poetry, surface treatment, personal branding, and memory and historical narrative, both individual and collective. The stream-of-consciousness, elliptical prose layered throughout their work creates surprising—and occasionally startling—juxtapositions that produce moments of lyrical profundity and accidental poetry. All that potential energy, 2019, is a large-scale mixed media work on paper covered in layered gold leaf. The gilt surface of the work is a consideration of both the material’s elemental qualities—gold is a highly conductive metal and has been used in electrical wiring since the days of the telegraph—and its historical use in art and architecture, as suggested by the beautifully-sculpted hand that centers the composition. Into the grey night we go, 2019, is also an exploration of surface and material, in which delicate graph paper cut-outs represent fragile infrastructures and rich passages of orange poster board and pigment recall the gleam of construction signage under the headlights of passing vehicles at night. There is an ambiguous darkness to the composition that proposes both an end and a renewal. These works are preoccupied not just with the surface of the pictures but also, ultimately, the process of art making. They invite the viewer into a space suffused with possibilities for revelation and continued exploration. In a tomb, 2017, Evans replicates his childhood bedroom in a shoe box. The impetus for the work was his parents’ sudden and dramatic split after forty years of marriage the previous year. As he recalls, “Now I was getting to know my mum, and I remembered this one time she helped me make an Egyptian tomb in a shoe box for school. I was big into ancient Egypt like many children were, and through it I began to look back before I was born down the long road of history.” The work is a nod to the rare special moment Evans and his mother shared in his childhood, as well as a way of mourning the demise of his parents’ marriage. It touches upon both intensely personal pasts and the broader strokes of world history. The microcosm of the personal and the macrocosm of the universal are also syncretized in The World Again, 2017, a map of the world filled up with other worlds—and other planets—all hand-drawn and labeled. Its title recalls a 2002 piece in which the artist imagined the world as a giant, man made island. With The World Again, Simon Evans and Sarah Lannan represent the world as it is today using the archaic language of cartography. The seeming condensation of the universe into the palm of the hand—achieved by smartphones and tablets—is reflected in the densely layered worlds that fill the composition. Several other works in the exhibition continue the play between past and present. The city of lists, 2019, is an abstracted landscape of a city of cities, both ancient and modern, in which a length of classical meandros is juxtaposed with a contemporary wall clock. Relic, 2019, is—like a tomb—a work inspired by ancient Egypt. Hieroglyphic illustrations are interspersed with layered lists and phrases at turns profound (dear god i miss the old dark ages when your face was the sky/ in this new one all we have is money and whatever we want to think) and profoundly silly (Photographing your salad turns it in into a ghost). It is a picture that attempts to capture the flux of time through naming and listing, with small everyday acts and thoughts reflecting the movement of human civilization through history. Simon Evans™ (Simon Evans, b. 1972, London and Sarah Lannan, b. 1984, Phoenix) has exhibited extensively, both in the US and internationally. Significant solo museum exhibitions include Palais de Tokyo, Paris (2016); Museum of Contemporary Art Cleveland, OH (2013); Musée d’Art Moderne Grand-Duc Jean (MUDAM), Luxembourg (2012); Aspen Art Museum, CO (2005); and White Columns, New York (2005). Simon Evans™ was featured in the 12th International Istanbul Biennial in Turkey and the 27th São Paulo Biennial in Brazil. Work by Simon Evans™ is included in the permanent collections of major institutions worldwide, including the Berkeley Art Museum, CA; Cisneros Fontanals Art Foundation (CIFO), Miami; Honolulu Museum of Art, HI; Louisiana Museum of Modern Art, Humlebaek, Denmark; Pérez Art Museum Miami, FL; Musée d’Art Moderne Grand-Duc Jean (MUDAM), Luxembourg; Philadelphia Museum of Art, PA; Museum of Art Rhode Island School of Design, Providence; and the San Francisco Museum of Modern Art, CA. Simon Evans and Sarah Lannan currently live and work in Brooklyn, NY.